Being an advocate of learning how to restore fertility before it is too late gives me a somewhat distorted view of the world. I do recognize that there is such a thing as too much population. Indeed, among my pleasant childhood memories are any number of trips into the Florida wilderness, generally led by my big brother. We would cycle many miles to a place where a lake had drained long before and where there were innumerable snakes to be hunted. We would push along streams for hours looking for piles of pebbles among which we could find fossilized sharks’ teeth. There was always the dream of finding an arrowhead, but I don’t think we ever did. He was more energetic and keener of eye and found many teeth where I found few. I did find a very large one, more than half an inch long, which I spotted from a high bank. At first I thought it was a leaf. There were vines we could cut and swing on like Tarzan. There were animal tracks. Of course it is all now buried under urban sprawl. The remaining wild in those areas is pretty much swamp into which anything of interest is likely to sink forever, and where snakes and other animals are few. One friend of mine told me that there was indeed a place where arrowheads could be found. It was a bit of high ground near a stream, which makes good sense. But even when he told me the whole area had long been paved over for a parking lot for a shopping center. They were strange and wonderful adventures. I never in my life have understood why you would let anybody move into your county, much less your country. There was always only so much magic, and magic did not extend to suburbs. Meanwhile the world’s population has gone from 2 billion to 7 billion, and I sense magic is on the wane everywhere. There is a place in South America where a girl once had a vision of the Virgin Mary, but she wasn’t sure of just where, only that it was near a certain church. So the church authorities decided that the vision was true bill and the site should be preserved. So the whole area, more or less covering how far a child could walk, was declared holy ground: no building, development, hunting, mining, cutting trees or farming. Well that spot has animals that have gone extinct everywhere else on the continent. There just aren’t any other untouched areas. There are parks, but they are more recent. So yes, too many people. But I still would like to see some people remain, at least a couple of million. That way we could maintain a literate society that was technologically competent, although probably not as advanced as now. Some years ago somebody (Paul Ehrlich of the Population Bomb) had predicted that we would run out of natural resources and that doomsday was at a time now in the past. 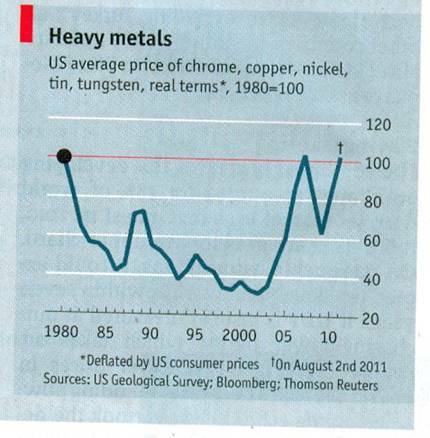 Another (Julian Simon of the Cato Institute) countered that technology was progressing so well that the price of metals was going to fall. (The Revenge of Malthus ECONOMIST vol. 400 no. 8745 August 6, 2011 page 65) The outcome is nicely charted by the journal. Simon won the bet, but as you see the prices went down and then went back up again. I rather suspect that the rise was due to unexpected prosperity (relative to now anyway) than to unexpected population. However the take home message seems to be yes, there are limits. All I insist on is that there are limits on both sides. There have been 21,535 visitors so far.